TL;DR for convenience [spoilers]: to resolve the game stuttering issues introduced with the Creators Update, we did a clean boot of Windows – no start-up apps & services. No stutters after a clean boot – re-enabled only critical start-up apps & service, and still no stutter. First, let’s deal with the Game Mode and frame rate thing. The Creators Update, and accompanying Game Mode, has been a mixed bag for some. My perception is that Game Mode seems to help, or makes no difference on, lower-end systems but manages to hinder the higher-end ones. In most threads I see, the people reporting issues are also reporting relatively modern, powerful systems. As for myself, I have an AMD 8350 coupled with an R7 260X – so not exactly beefy – and the CU/Game Mode do not seem to have caused any trouble for me. That said, I don’t run FPS counters constantly so if something is a frame or two down or up, I’m not likely to notice (I’ll run counters over the next few days and test Game Mode – if I see differences, I’ll update this post). But while I haven’t seen trouble, a friend has. Running an i5 7700 and RX 480 8GB, he noticed that every few seconds his frame rate in GTA V dropped from 60 (he’d capped it there) to about 57, and he would notice a brief stutter (he saw this behaviour in Battlefield 1 too). We tried the usual suggestions – disable Game Mode and associated Game Bar features, a clean reinstall of the latest AMD graphics drivers (17.5.1), that sort of thing – but this hitherto unseen stutter kept a-stuttering. Frustrated, and almost as a joke, said friend contacted MS’ Answer Desk – you know, to complain and blame them for ruining an all-too rare gaming night. The MS tech he talked to, John Frederick P. or something like that, made a remote connection to the machine and did something so simple we could kick ourselves: he tried a clean boot. For us, this raised a peculiar question: have we gotten so used to the responsiveness of our SSD-powered systems, that we’ve allowed ourselves to become lax in our management of start-up programs and services? Certainly the CU has had a hand in the frame rate stutters – all the same startup stuff was running before the update – but it’s still an interesting question, one which speaks to the re-enforcement of good practice when it comes to minimising bloatware on your system. Besides the stuttering problem, I like the idea of Game Mode – it points to a desire of Microsoft’s to help people eke out as much performance from their systems as they can. Especially older systems. The typical caveat, though, seems to be that multi-tasking performance suffers with Game Mode, because of how the game (or Game Mode-using application) is prioritised over everything else on the system. As one with an octa-core CPU that does a delightfully fine job of multitasking, even if the 8350 and my graphics hardware may be a touch long in the tooth, this might see me forego the use of Game Mode personally. But you sorry suckers with dual cores might just have gotten a little more spring in your gaming step. If you’d like to read more about Game Mode, the ever-in-depth Wesley Fick has talked about how it works and how it might be great for Ryzen processors, and Rock Paper Shotgun has done a review bit on it. Good question. I don’t know why they’re there. I don’t like them or the permeation of obsessive marketing and customer-tracking corporate culture that seems to have spawned them. Thankfully, there are ways to get rid of them, which don’t involve third-party applications. The fine folks over at How-To Geek have done a stellar job of listing up these various nefarious “offerings” and their means of disability them, so rather than rehash their work I’ll just point you to it. Umm. Yeah, that’s about it. I like it. Very nice for those all-too-often times Windows has itself an update to download, but you’re trying to game online – especially if you’re running an Insider Preview build (because those are updating damn-near all the time). Or, uh, check the news or Facebook or stream something. 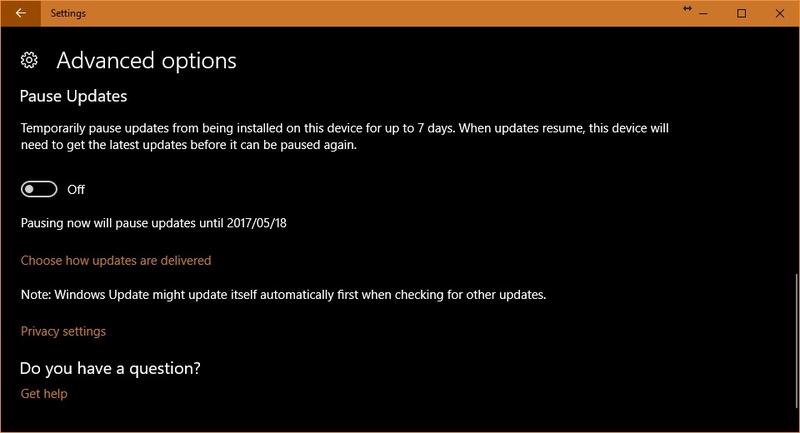 You can now have updates paused for a week, after which your machine will need to update before it lets you pause again. You can unpause whenever you like, so if you just want to do something uninterrupted for an hour or three and let the updates carry on later, you can do that. In-progress update downloads can be paused too. 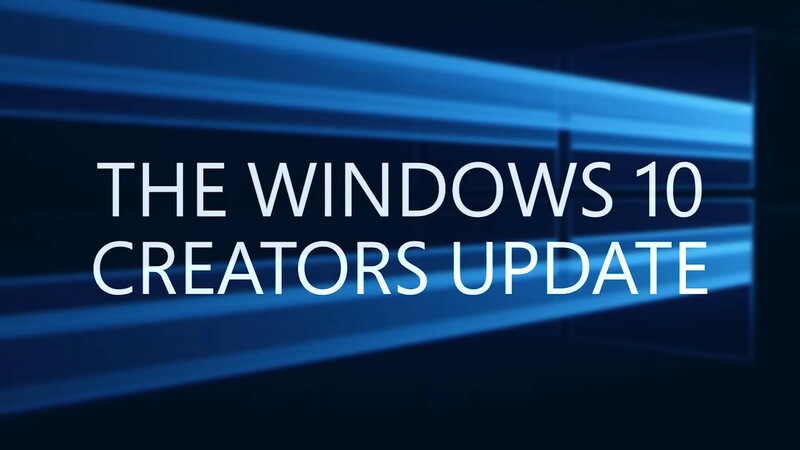 Yes indeed, there was a lot more to the Creators Update. HTG, again, have done a good listing. There’s some cool stuff for the developer crowd too, with updates to Bash and the Windows Subsystem for Linux (WSL), bringing greater tool compatibility and Ubuntu 16.04 support, among other things. Shamefully, I have yet to try Windows’ Linux subsystem and the Bash features – usually preferring to spin up some Linux VM if I want to try something – so I hope to make a point of testing this stuff soon. Microsoft’s making some great moves in support of open-source and community-powered initiatives, which is really very heartening to see.